I was told by many experienced travelers, ‘Once you are in Yun Nan, you will never want to leave…’ I was pretty perplexed, is it because it’s too beautiful to leave, or something else holds you up?? With this puzzle hovering around my brain, I took off on Oct 3rd, with my friend; we were sitting beside the window, watching the tarmac driving far away from us as the plane slowly lifted itself up to the cloudy sky. Like Vietnam, initially I thought even without any specific plan, we could play to our hearts content so long we were not overly adventurous. Well, we were sort of right, however we did suffer a little bit from insufficient preparation. The first stop was Kunming, if you want me to comment on this city, well, I would say big city was always alike, concrete jungle… but Kunming is more mixed compared to Shanghai, where the whole town was sunk in clusters of sky scrapers. If you drove for 20 min from downtown, you would reach one of the most notorious mountains—The West Mountain (西山), the local suggested lovers better not to trek there, as there used to be many heart-broken stories happened so that majority of the lovers who climbed to the top of this mountain would be cursed till they separated once they climbed down. Sounded pretty spooky… Aside from that, the tram rail which directly took you up to the mountainside in my opinion definitely got your money’s worth though the tram itself looked quite dodgy, but if you love challenge, the scenery ahead of you would undoubtedly be your best bonus. On Oct 4th, we decided to desert Kunming for a while and drew ourselves closer to the world marvel—Shangri-la. Rome can’t be built overnight, when we checked the bus timetable in the hostel, it would take 13 hours from Kunming to Shangri-la county. This time in order to reserve more energy for this trip, we chose to fly to Kunming rather than the economic sleeper on the train, we didn’t want to be too knackered to walk around right after we arrived Shangri-la, either. The optimal means was to have a stopover on our way there, a couple of days rest would retrieve vitality, but the nodus was where the stopover would be. After several round of screening, the answer was obvious: either Lijiang or Dali. What further exacerbated us was the bus from Kunming to Lijiang took 8 hours, to Dali, 4 hours; whereas, Lijiang to Shangri-la 4 hours, Dali to Shangri-la 8 hours… the total amount of time we would spend overland was no difference, it depended on if we would like to suffer sooner, or later? I was a bit reluctant to go to Lijiang as I was overheard heaps of negative comments against this town thanks to its over exploitation. 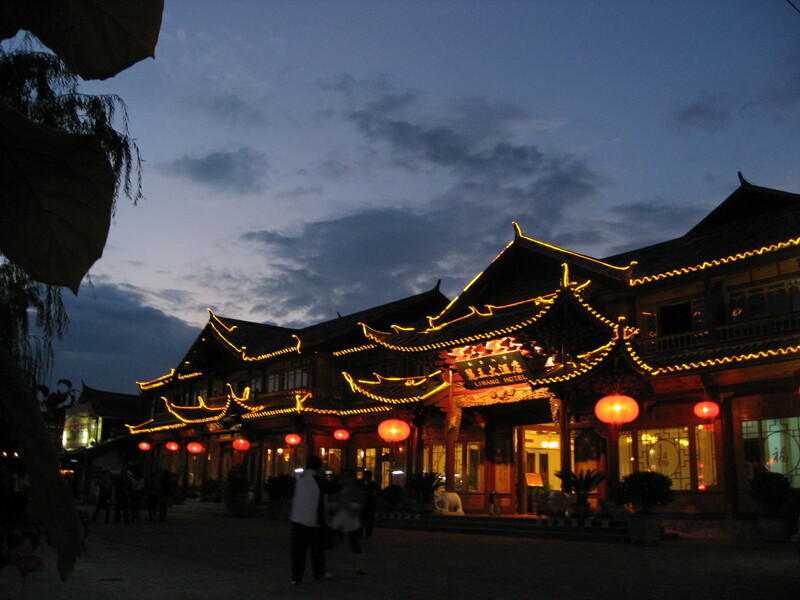 Whatsoever, Lijiang has been color-printed on every must-visit attractions in Yunnan. Skip Lijiang as if we skip the Great Wall in Beijing… Thence, we opted to suffer sooner rather than later. The first day in Lijiang was almost blown us away. Its unique architectural features, pagoda like tile roofs with red lanterns and copper bells hanging on the eaves; dark grey bricks stacked houses closely adjacent one from another with sophisticated auspicious patterns carved on the wood-made window panes; granite paved roads polished shine by thousands and millions of steps contributed by the tourists from around the world; the meandering streams from the Jade river acting as a moat across the whole town and pasting all the houses… It in a sudden rewound me back to Hong Cun Village situated in Anhui province and West Street in Yangshuo County, Guilin. But Lijiang Old town happened to be listed as one of the world cultural heritages for the sake of its 800 year history starting from Late Song Dynasty, as well as its unequalled Naxi Minority culture. I went to watch the most renowned Naxi Ancient Music show upon arrival. More than half of the performers aged 70 upwards. Three of them were almost 90 years old, who were playing the those antique musical instrument which I’ve never seen anywhere in my hometown. They were described as the ancestors of the modern Chinese instrument. Their music used to be played during the heyday of the glorious Han and Tang Dynasty and probably during the time of Confucius himself. Many pieces tended to be cleanse your soul and express exquisite joy of living. Dr. Xuanke was the most well-known advocator of this ancient music. Due to his great effort, Naxi Ancient Music has traveled around the world, and passed down from generation to generation. The current Lijiang to me was more like a heaven for shop-holic. Almost every household restored its ground floor to a boutique shop, selling kindreds of Naxi deco, trinkets, accessories and some handcrafts, which were similar to those in any tourist attractions around China. The most exclusive handcraft is Piao shaped wood-craving. Piao is the dried and hollowed-out shell of the gourd, often cut into half, used as a drinking utensil. The indigenous craftsmen first shaped a block of wood to Piao, then carved directly on the bulge of a curve with very sharp graver, from a conventional drinking utensil to a piece of artwork, this extraordinary ancient technique has on the other hand refined Lijiang’s minority culture. Impression on Lijiang was more or less controversial, when you peak through its materialistic appearance, you could still capture the deeply-rooted ethnic culture that fortunately is still being recognized and preserved fairly well. As we are flocking into a new era, we can’t allow this old town stagnant as it was, modernization will in the end be a must and incorrigible, the only thing we could do might be more tolerant against what have happened to it, and retain and respect its unique culture that differs itself from the rest. We ended up in Lijiang for 2 days, because my friend experienced terrified altitude sickness, whenever she ate anything, she started to vomit in no time… the dream of going to Shangri-la turned out to be a bit dim. God may have noticed how strong our will was, sent a lucky angel to help us out. We got to know a driver who agreed to drive us from Lijiang to Haba Snow Mountain with the price of 60rmb each, then to Shangri-la in the following day. En route, he gave my friend some free medication particularly for altitude sickness. We eased ourselves for one night in his house when we reached Haba Snow Mountain. It was a small Hui Minority village, composed of 80 households, people all knew each other, after we put away our backpacks, we followed Master Bao (our driver) to drop around. Almost every household we stopped by knew Master Bao, showed their greatest hospitality to us by giving away so many fresh walnuts, apples, papayas etc as presents, abundant fruits, vegetables, and corns made this little village relatively prosperous compared to the others. However, we were told that they started to have electricity not long ago, which was out of my imagination…After all, agricultural richness is not equivalent to the industrial prosper. Within two days, we’ve already fallen in love with this little town, where was cultivating so many warm-hearted villagers, untapped virgin forest, and delicious gourmet. We were extremely reluctant to part with Master Bao and his family, but our journey needed to be carried on. Next stop—Shangri-la… a name only appeared in the book titled “Lost Horizon” written by a British author James Hilton, now officially has been used as a county’s name in Diqin Tibet Autonomous prefecture. In the British encyclopedia, Shangri-la was explained as a distant and secluded hideaway, usually of great beauty and peacefulness; or an imaginary, remote paradise on earth; utopia. In Tibet language, they also had a homonym called “Xiang ba la”, meaning opposite bank, where people have no diseases, greed nor hatred. To see is to believe. As soon as we stepped out the car, we almost jumped to our feet, but an unexpected blast of chilled wind swept through our face. We never anticipated how cold Shangri-la would be, well, there was no point crying over spilt milk. As soon as we feet our way to a guesthouse nearby, we eagerly asked for some hot brown sugar ginger tea to warm ourselves up. While trembled and curled ourselves in the corner of the sitting room, we were sneaking a peak at a young charming girl with pure black straight hair knitting beside us. I managed to exchange a few words with her in order to distract my attention from the unbearable coldness. She said she was Hui Minority, same as me, living here and running this little guesthouse for quite a while, had a 6 year old kid, but she was still in a pretty standard shape. We could tell from her blissful smiling face that life treated her well. She suggested us to work out a little bit by wandering off around the Du Ke zong Old town; also in the Si Fang Lou courtyard, at 19:00pm every night, most of the Tibetans would gather together to Tiao Guo Zhuang (perform Guo Zhuang Dance). That would be a not-to-be-missed opportunity to get to know of Tibetan culture. 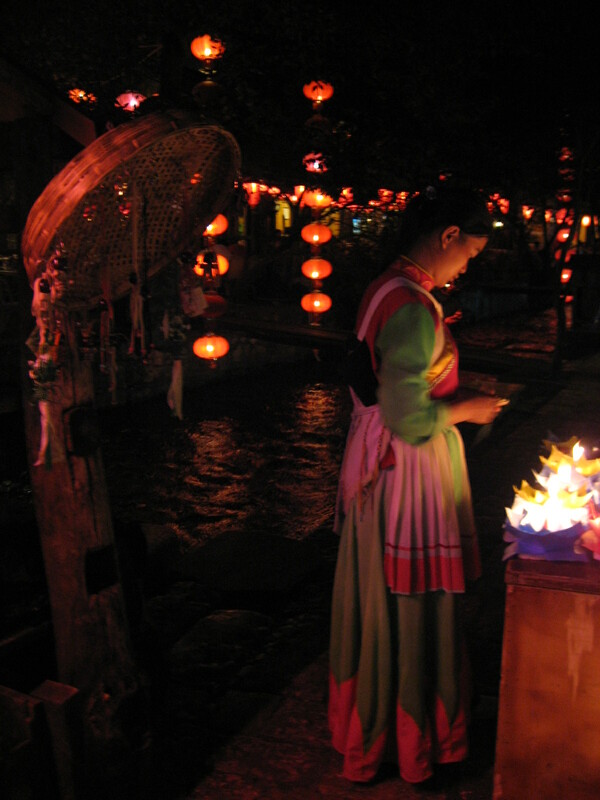 Guozhuang is the homonym of Tibetan language “Guo Zhuo”, meaning dancing around the bonfire in the backyard, normally to be performed in a family feast or reunification. It’s an iconic dance for Tibetan people, of which the form may vary slightly from county to county. 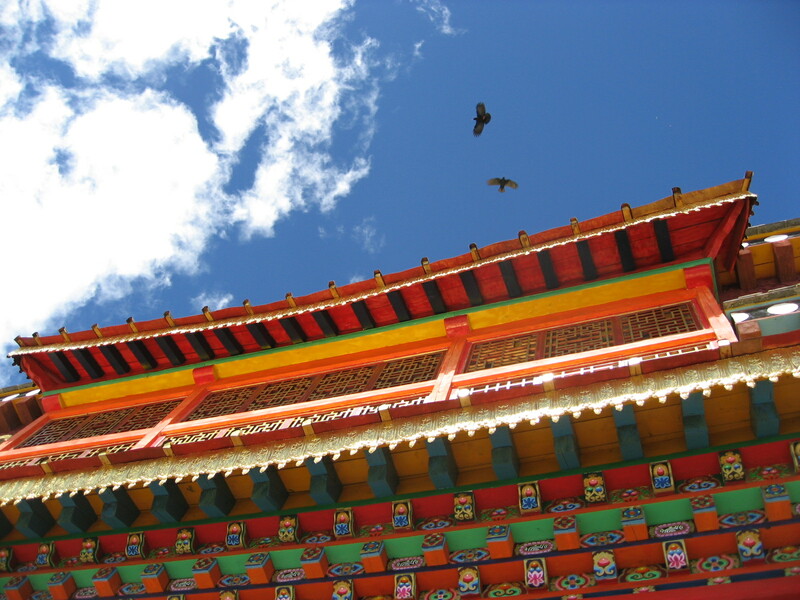 We stepped out of the room, followed by the typical Tibetan music reverberating in the air. Since we were away from Shanghai, we never saw so many people like that night, sprays of crowds worn in various colourful costumes and turbans surrounded in a circle, hand in hand, shoulder by shoulder, kicking their feet back and forth after the rhythm of the music, we were also being cheered up by its festive atmosphere, feeling like being part of them, imagining everyday was a festival, how exhilarated we would be. We danced, sang, laughed and shouted till midnight as if we were like a 6 year old kids, lightheartedly immersed ourselves in such a delightful ambiance. No worries, no hassles, nothing would ever bother us at that moment; we were just ourselves, absorbing the long lost bliss that we should have had ages ago. We were lucky enough to continue driving upwards to Deqin where the most sacred mountain—Meili Snow Mountain was situated, each step en route formed a new scenery, even the air turned out to be considerably fresh and crisp albeit lack of oxygen. The virgin forest over there were very special compared to South East Asia, for the sack of shortage of moisture, those trees didn’t have gigantic roots, but were covered with light green lichens, a type of fungus, forms a crustlike or branching growth on rocks or tree trunks, which only survived in pollution-free areas. In the end we weren’t able to see the marvelous moment－Ri Zhao Jin Shan (Golden Snow Mountain: the morning sunlight turning the snow mountain to golden) due to the monsoon season. The thick veil of the haze was torn for a moment, to display the jagged outline of the peak, then closed in two shakes, as though Mt. Meili was playing peekaboo with us. However, time didn’t allow us to have this endless waiting, left a piece of shame, we had to wave to say goodbye. Nothing was perfect in the world, so was each journey, a little feeling of incompletion will trigger me to head there again some day. Mt. Meili, let’s take a rain check! This entry was posted in Yun Nan. Bookmark the permalink.